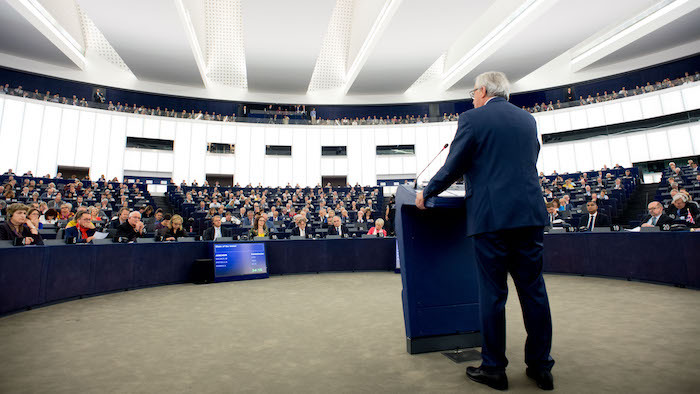 European Commission president Jean-Claude Juncker on Wednesday morning (13 September) delivered the State of the European Union speech, also known as Soteu, at the European Parliament in Strasbourg. It was the third time the president of the commission has held his annual address to MEPs. In the Soteu, Juncker reviewed his institution's achievements over the past year, presented the priorities for the year ahead, set out how the commission will address the most pressing challenges the EU is facing, and sometimes shared his personal views on the future of Europe. The speech was followed by a plenary debate with MEPs, kick starting the dialogue between the parliament and the Council of the EU for preparing the commission's work programme for the following year. Although they may seem dull, especially to people outside the EU bubble, Soteu speeches are one of the very few occasions in which the commission's president publicly speaks about what he and his fellow commissioners have done so far, and shares his vision for the coming months. It's the closest thing the EU has to a general policy speech by a national chief of government. Therefore, it is interesting to have a closer look at its language and the words that are used, as they speak for which concepts and issues have been marking a specific period, and what the EU is – and will be – focusing on. 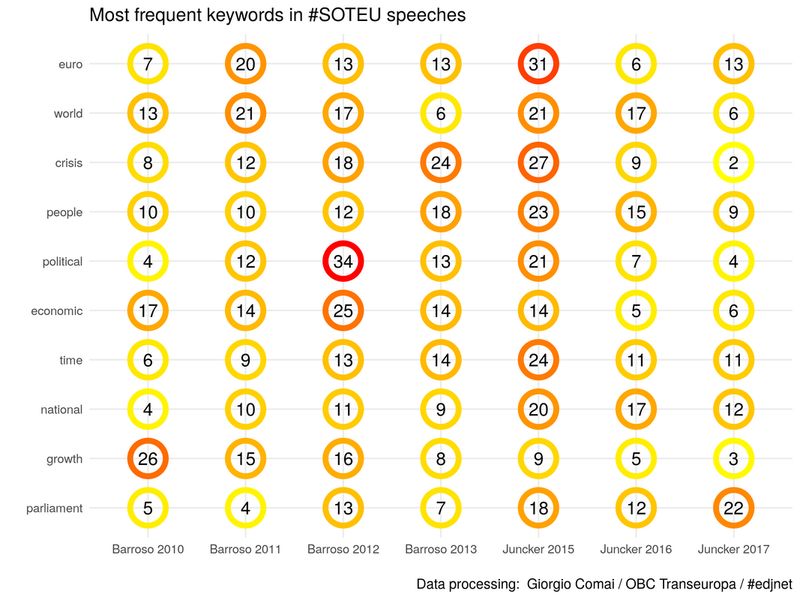 What are the 20 most used words across all of the seven Soteu speeches, along with their frequency. 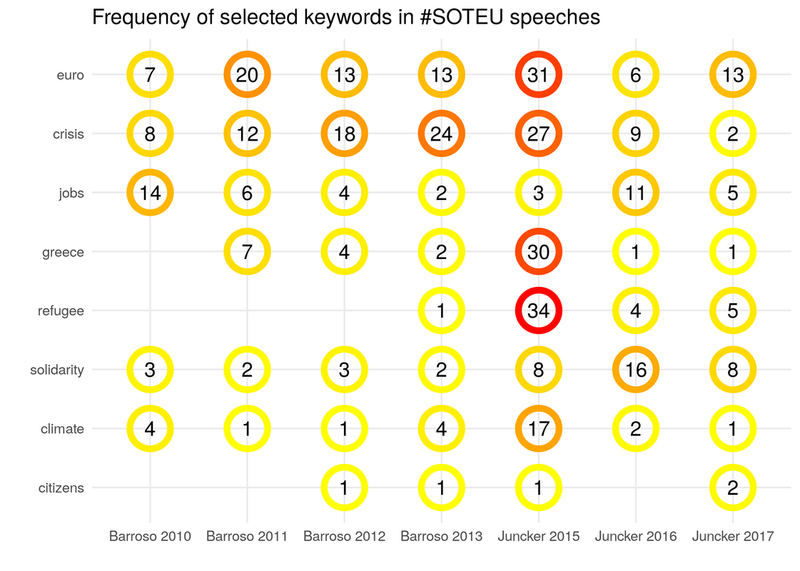 The figure refers to the number of times the most frequent words in all Soteu speeches are pronounced during each of them. The colour of the circle reflects these data, with red reflecting more mentions. The following wordcloud compares the frequency of words across speeches (recurring terms have been excluded), showing the words that are most frequent in each of the speech and are at the same time less frequently found in other speeches. 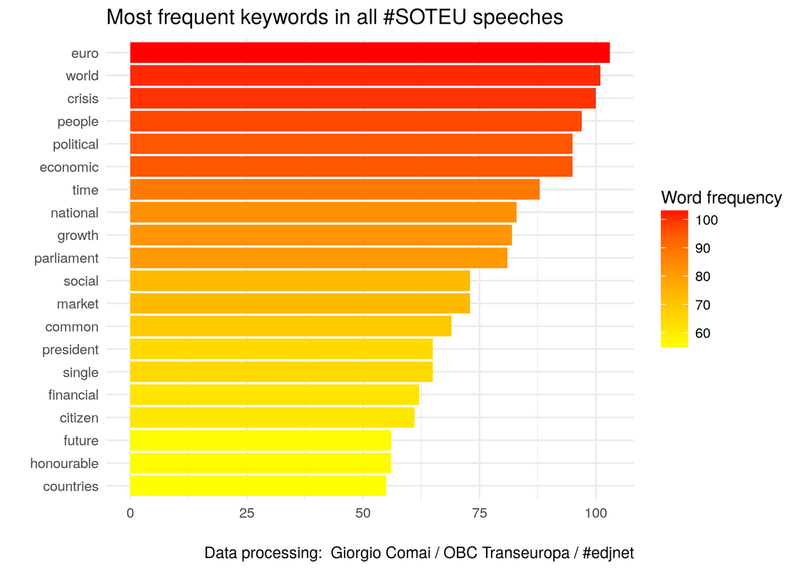 This cloud shows the number of times a selected keyword is pronounced during each of the speeches. The colour of the circle reflects these data, with red reflecting more mentions. Here, we chose to monitor the most salient words, not the most used. 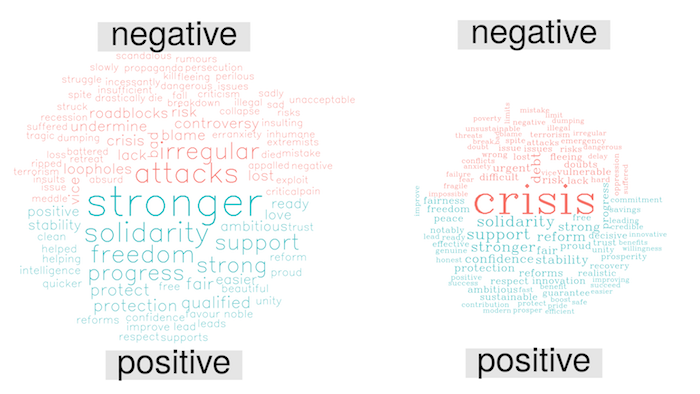 These wordclouds show the balance between positively and negatively connoted words used in Soteu speeches. 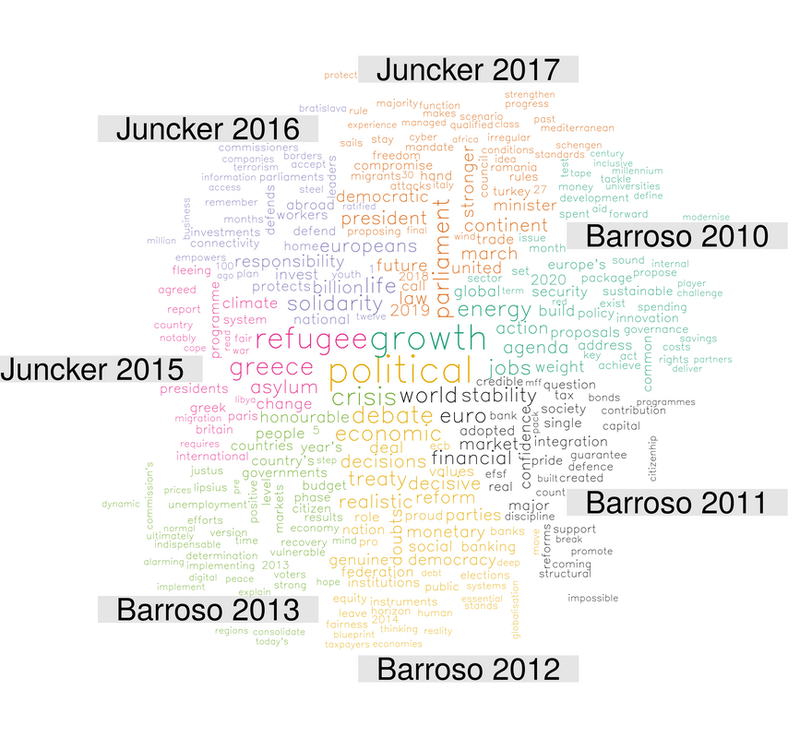 The cloud on the left refers to the 2017 Juncker Soteu speech, compared to all Soteu speeches (2017 included), on the right. These graphs and the code are distributed under a Creative Commons license (BY). In brief, you can use and adapt all of the above as long you acknowledge the source: Giorgio Comai/OBC Transeuropa/#edjnet .